Pork sausage stands in as a time and effort-saving alternative to meatballs. Vegetable bouillon is the secret weapon to adding flavour to the sausage, which is added to spaghetti and your favourite carbonara sauce. A comfy, cozy meal for a crazy busy day that needs a simple, but tasty, pasta dish to put all right with the world again. • While your pasta water is heating up, preheat a skillet with Canola oil over medium heat. • Depending on the size of the sausages you have, quartering them should be about the right size for this dish. • Cut up onions, slice mushrooms and add both to the skillet. • When mixture begins to brown, add crushed minced garlic and Italian seasoning and stir to distribute evenly. One good option for a touch of smoke flavour is to add either a couple splashes of liquid smoke or 1 tsp. (5 ml.) smoked paprika. • Once garlic begins to brown, stir in carbonara sauce then dissolve in 1 organic vegetable bouillon cube. • As the sauce begins to bubble you can also add ¼ cup red cooking wine but be wary of the saltiness because both the wine and the bouillon can be quite salty. It’s always best to taste as you go along (not the wine, the sauce). Simmer sauce over low heat stirring occasionally. • With your pot of water now boiling you can add your pasta noodles along with 1 T. (15 ml.) of olive oil. I prefer either whole wheat or gluten free noodles. Spaghetti squash is also a surprisingly tasty and nutritious substitute. • When your pasta is ready (do not over-boil or undercook pasta) drain and pour into a serving dish and mix in some extra virgin olive oil. 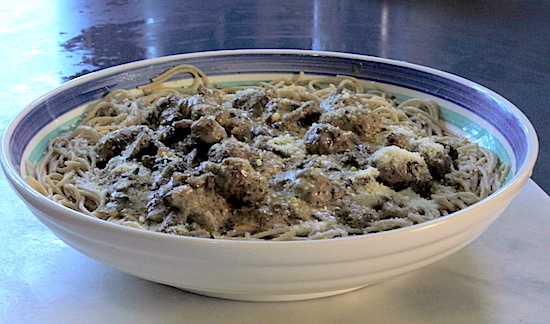 • Give the cream sauce one last stir and pour the creamy, steaming goodness over the noodles and sprinkle on some freshly grated Parmesan and/or another cheese of your choice. Still haven’t been able to find moose or caribou cheese in Canada but maybe one day. Serve with some crusty bread and enjoy this very easy to make comfort food!